The perfect outfit to become a champion! Remember: good technique can take down even a bigger, stronger and faster opponent, so we recommend our Tackle Football Women Costume for your next game. Costume includes: denim padded vest, matching pleated denim mini skirt (with invisible zipper closure at the side), jersey lace up front red top, football and long socks. Made of 100% polyester. Care instructions: hand wash separately, drip dry, do not bleach. 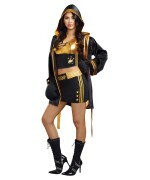 Review(s) for " Tackle Football Womens Costume"